The stage is a mound of dirt. It feels spare and raw. A Woman emerges. We don’t learn her name, but we’re about to learn all about her. In an Irish lilt and a unique, sharp-edged syntax, she tells her story. A Girl is a Half-formed Thing, adapted by Annie Ryan from Eimear McBride’s 2013 novel, is a performance piece that takes the intense, interior world of a young woman filled with jagged, broken thoughts and brings it to the stage for examination and catharsis. As you enter the theatre, you’ll receive a content warning: the play discusses sexual abuse. The staff are happy to help answer questions and assess your comfort, but the warning is there for a reason: this is a harrowing ride. Ella Prince plays the Girl from in utero and beyond, maturing nimbly as she tears through the 75-minute monologue. It’s the Irish storytelling tradition reinvented for persecuted and frequently voiceless women. It’s about all the ways a woman can be hurt and long legacies of abuse. And the Girl is going to tell it exactly as she remembers it, and exactly the way it feels: tumultuous, rough and un-pretty. When McBride’s book hit shelves it was instantly notable for its stream-of-consciousness narration that took language, smashed it, and morphed it into something new. It’s a little Joyce, a little Beckett, but all McBride. The sentences, like the titular girl, are half-formed; onstage, we fall into her rhythm quickly and there’s no gap between her speech and our comprehension (the first several pages of the book, by comparison, can be difficult to parse). The Girl’s strict religious upbringing (with a side of physical abuse) shapes her sense of shame and of rebellion; when she is sexually abused as a teen, she reacts with the only tools she has to her disposal. She falls into a fraught journey towards, she hopes, some kind of liberation from the expectations placed upon her and the trauma she has suffered. But trauma is a thorny thing, and identity is difficult to establish and shape under the best of conditions. She has a brother she loves, a boy who was sick as a child and over whom she’s enormously protective; he might be the one person in her life whose love was given unconditionally. His life twines with hers; she measures her age in comparison to him. When his life changes abruptly, so does hers, and the play storms towards an ending that can’t really be happy – but which, as an audience, you can’t help but hope it will have some element of peace for her. Erin Taylor – who is making a name for herself as a director in the independent theatre scene with a knack for deft and emotionally precise world-building – is as vital as Prince to the success of this production. Together they have built vivid, relatable imagery out of difficult sentences, giving the show a feel of shape, movement, and colour; there’s deep variation and clarity to Prince’s performance, and she finds the tenderness and even comedy in the Girl’s barreling, uncompromising, story. Taylor’s all-female creative team has built a structure to support Prince, and to bring the text forward with deliberate empathy. 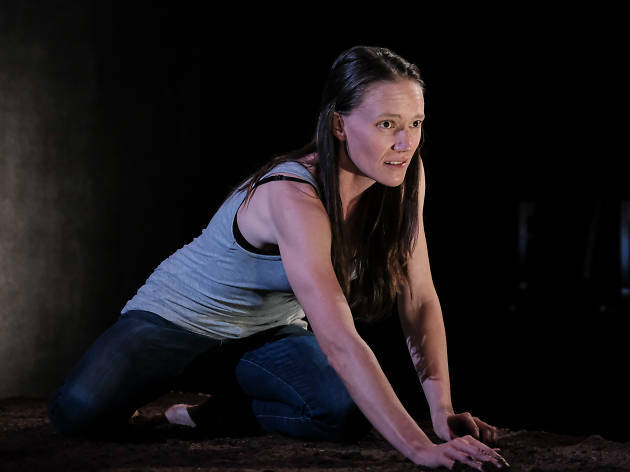 Isabel Hudson’s set design of fresh-turned earth grounds the production in earthy, rural Irish balladry; Prince is barefoot in the elements and this helps to keep her present and human to the audience, rather than ethereal and therefore dismissable. 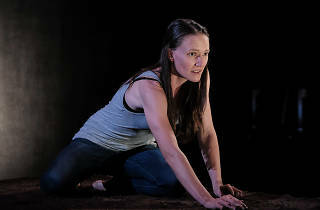 Veronique Bennett’s canny lighting rig and slow, sweeping light cues are essential to building and enhancing the story; Clemence Williams’ sound design adds shape and narrative direction to the monologue. At the end of the play, many audience members were wiping away tears. But what caught my eye was an unassuming dried rose laid carefully on the mound of dirt, previously unnoticed. It appeared to me like a perfect moment of grace: a gift of beauty after such shared trauma.